Ahh man. I’ve been procrastinating on this. Why? I knew this month’s report would not be pretty. But theres a reason! There’s been a major legal issue that’s been consuming a lot of my energy/time/money. It started to take up a lot of mental real estate as well. However, near the end of the month – I got the opportunity to sit down with my mastermind group – which just happens to be my family at the moment. I asked them “from the outside, looking in” what things did they see that I could improve. The number one suggestion I got was that I couldn’t let my life stop. I had to keep pushing. Keep moving forward with all my goals. Creating Music: Created ..half a beat..”nothing to see here folks” – moving on. 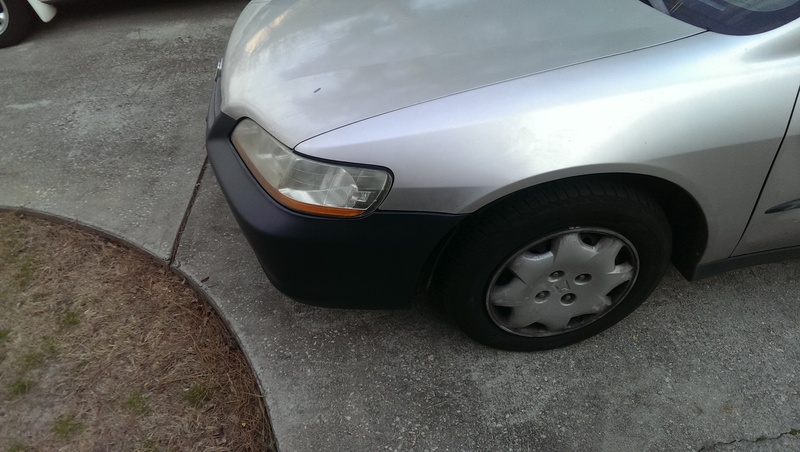 So my car sustained some damage when one my cousins decided to challenge a stubborn support column with my cars front end. 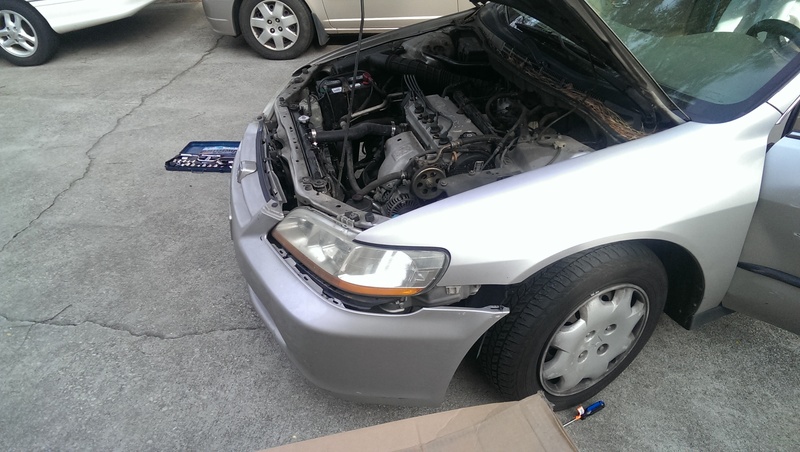 (Nobody’s confessed to it yet) *looks at cousins side-eyed* But it was great, because I got the opportunity to buy the parts myself and throw a new front end on the whip. Finding I’m really enjoying fixing things with my hands. 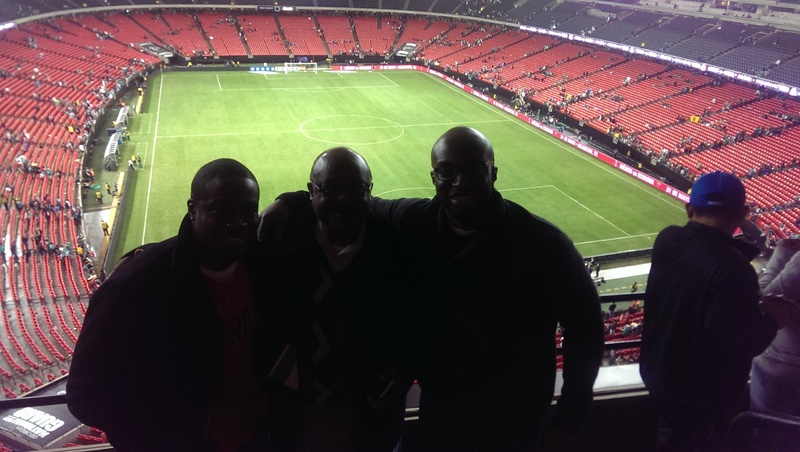 Also took my dad and brother to a Nigeria/Mexico Soccer game. It was great just chilling with them. Yea I know you can’t see our faces. lol. Socially: March was a great month. Got to hang with old/new friends as my Alma Mater made it into the sweet sixteen and beat Duke! Made time to spend with friends..In the past I definitely prioritized friendships last. Definitely learning that friendships and relationships have a real value that, although you can’t necessarily put it on a ledger – proves worth the investment. Spiritually/Self-Improvement: I finished two books for self improvement: 1. The Four Enemies of the Heart & The Principle of the Path – by Andy Stanley. I bought 2 more for the coming month. Been consistent with sending out the bible verses to friends and more often than not – I discover things about myself and how I relate to God, and it explains some of my behavior in the past, as well as helps to protect me from making the same mistakes over again. Life lessons learned in March: 1. Focusing heavily on the issues that I struggle with (self-confidence, people-pleasing) and leaning on God for strength leads to real gains/benefits. Having conversations with people who know me and are willing to call me on my BS is invaluable. There is one person in my life who CONSISTENTLY calls me on my BS and as a result – I learn something about myself on every interaction with this person. I grow infinitely faster with her than with anyone else in my adult life. I deeply appreciate it. All in all, even with the speed bump that lasted most of the month ..it was a good month. I’m blessed to be alive. To be healthy. To be able to enjoy life. Thanks God. Fly or Fall.